Need a little rest and relaxation? Want to get away for a weekend, for a month or two? Welcome to Gone Fishin' Cabin. A family friendly great place to be closer to mother nature, to unwind and to relax anytime of the year! Cabin offers 70 ft of private oceanfront with low bank for easy access to your own beach. Bring your boat, cabin has a private boat buoy for your use. Also, the cabin has an open concept design with a light and airy cozy comfort for your stay. Currently, we are offering our SUMMER rate of $179/nt for a stay during May-Sept with a minimum of 5 nights. Orcas? Definitely! One of the best key features, the cabin has amazing views of Puget Sound's Colvos Passage, Vashon island, sail boats, barges, and marine wild life. Within the cabin's grounds, we have a new kid's play zone. The 'Crab Shack' is an rustic play house with a lower level lounge and an upper loft area. Bring the kids' sleeping bags and watch the stars through the skylight! There's also an amazing Gorilla Playset with swings, monkey bars, clubhouse, climbing wall and a 5ft wavy slide. Hours of outdoor entertainment for the little ones! From the cabin's front door, you can walk, fish, clam, crab and kayak on the beach. Also, you can enjoy swinging on the hammock, sipping a cup of coffee on the deck's covered lounge area, soaking in the panoramic sea views and listening to the crashing waves. There's always catching sights of the local wild life... depending on season, you can see seals, sea otters, whales, eagles...etc. And of course, kids can collect shells, rocks from the private beach. At night, the whole family can roast smores in the fire pit while watching the stars. Cabin inside amenities: 2 bedrooms (one with queen bed, one with twin top/full bottom bunk bed and fold-out foam single sofa/chair), sleeper sofa w/queen bed, portable crib, 1 bath, open floor plan, comfortably sleeps 4 adults and 4 kids, flat screen TV/DVD combo with cable service, broadband Wi-Fi access, washer/dryer. All linens and appliances included. Fully equipped kitchen and bathroom. Oak HW floors throughout. Living room has gas stove/fireplace. Cabin outside amenities: private beach, salmon/trout fishing, red rock/Dungeness crabbing, clamming in community sandy beach, huge 2-levels deck with gas grill, covered outdoor lounge and eating areas, toddler/kid play area with play structures, double size hammock, and fire pit area with Adirondack chairs. Location: ~45 minutes from Seattle, either take the West Seattle Ferry or drive via the Tacoma Narrows Bridge. ~15 minutes to Gig Harbor. Also, cabin is ~30 mins from Tacoma. Gone Fishin' Cabin is located in Olalla, WA. And is a part of the Kitsap Peninsula in the South Puget Sound. Olalla means 'place of many berries' from the native Chinook word 'olallie.' 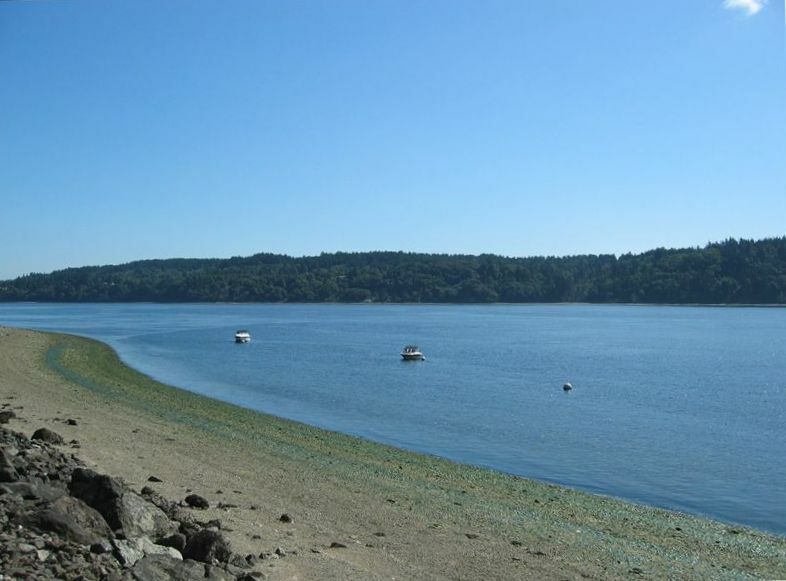 Situated ~8 miles north of Gig Harbor, it's a great starting point for hiking, biking along the shores of the Kitsap Peninsula on the Mosquito Fleet trail. And if driving is more your style, take the South Kitsap Scenic and Historical Tour. Or enjoy a fun filled day trip on the WA State Ferry to Vashon Island or Seattle city center. Cabin belongs to a secluded private neighborhood beach community. Prospect Point offers members only access to the community sandy beach, to boat ramp, to fishing pier - All within ~5 minutes walking distance from cabin. Check-in 4 pm, check-out 11 am. During July-Aug, we request a minimum of 5 nights booking. Please contact us for availability and additional photos/information! Welcome to Gone Fishin' Cabin, our home away from home in the Northwest! My husband and I both have busy careers. And like most working parents, we are challenged by balancing family needs with work schedules. The cabin is our little Puget Sound waterfront get away from the chaos of normal life. Here, we can enjoy a stroll on the beach with the sea breeze in our hair, take in the amazing oceanfront view while sipping our morning coffee, and listen to the crashing waves from the deck lounge. And the best part, the kids can play on the beach, go clamming, learn to fish or kayak in front of the cabin. Happy memories are made of these...! Gone Fishin' Cabin is in the amazing Puget Sound and within an hour from Seattle. We're super family friendly. It's easy to travel to the cabin, either by Ferry or by road. It's in a small rural village, but also close to Gig Harbor, a seaside port with a pedestrian waterfront, quaint shops, restaurants, and all amenities. As a family, we love just hanging out by the water and enjoying a relaxing time BBQing, fishing, crabbing, clamming, kayaking, snuggling with a book, or playing board games. When we feel really ambitious, then we go for a long walk on the beach. Taking it easy is what we enjoy best at the cabin. Close enough to town, but far enough for peace and relaxation in your own oceanfront tranquility. Direct access to private beach from cabin's rock wall. 180 degrees panoramic view of Colvos' Passage. Cabin has electric heaters adjustable per room. Cabin has washer/dryer stacker unit in 2nd bedroom closet. Parking pad for two cars and 2 more cars parallel to front of cabin. Living room has fold out queen sofa bed. Dinning table seats up to 8. It has easy extension slideout mechanism. Random selection of DVD movies are available for guest viewing. Cabin has dedicated kid's zone mulched area and a pet friendly grassy front lawn. Cabin has huge two levels deck. Fire Pit Area - Smore roasting galore! Double Size Hammock - Napping in the sea breeze! Kid's Zone - Hours of entertainment for the little ones! We had 2adults a 10 year old and 2 dogs. We all had such a wonderful time. House is well stocked and very clean. Comfortable for all of us. Views were amazing. We loved the slight remoteness of the location. Never could connect to internet but that was really not a major concern for us. Stayed just shy of 2 months while buying a home in the area. This place is all about the waterside location. We really enjoyed watching the wildlife - seals, sea lions, many different birds. You can walk down the beach when the tide is out. Be careful as some places are slippery. The cabin is pretty updated. You will never run out of linens! There's an apartment sized stackable washer/dryer, fridge, stove/oven, small microwave, toaster oven, gas grill on the deck. No dishwasher, so you'll be hand-washing. There were birdseed and hummingbird nectar on hand to feed the locals (which I did). If you have a long vehicle like an extended cab or bed truck, turning around and parking requires a bit of jostling. The neighbors are friendly. One helped us out with a jump when our car battery died. The owners are responsive regarding issues that arise. We had problems with the internet and they scheduled repairs promptly. We had the full-on Snowmageddon 2019 experience during our stay and they were helpful in letting us know updates on power and internet restoration. If you stay in the winter and there's a heavy snow event, be aware that weather can make the hill down the cabin challenging and that it can take some time to restore power when trees come down. The hot water heater is electric, so no power = no hot water. This was our 4th stay at Gone Fishing and still love everyrhing this adorable beach house has to offer. Just love being right on the water and waking up each morning feeling like we're on a house boat. We will be back soon! We stayed here for Christmas and had a wonderful relaxing time. You can see the wildlife from the living room or outside on the covered deck. You can fish off of the lower deck (uncovered and will be great in the summer) which in December was about 5 feet away. This is a great place, it was stocked with everything we needed and we had no paper towels the owners had then delivered that day. Thank you so much! We will be back in the summer. We loved our stay at the Gone Fishin Cabin! They had everything we needed and the things we didnt know we needed. It is truly a slice of heaven, we cant wait until our next stay! Had an amazing stay. Everything was perfect ! Highly recommend. House and view are amazing! House is perfect . View is even better . Lots to do for kids. My son loved the play area and indoor fort area. The house has a full kitchen , Bbq & it was great being able to cook at house and enjoy the view. Very quiet at night and morning coffee on the deck is serene . Something out of a movie . Highly recommend. Owners were great and explained everything prior to arrival . We will definitely be back . Thank you for an amazing week! Crab Shack play shed with rustic sleeping loft... Giant Gorilla outdoor play structure, board games, children's toys and fishing poles are available for your stay! Private buoy in front of cabin to secure your boat... Enjoy!